On a Creative Contemplations retreat we aim to develop a deep sense of connection with each other and a shared purpose. Our mission is to be as inclusive as possible - we want our retreats to be accessible to all, and when people are here, we want them to be on an equal footing. We hope a lone embroiderer pushing his comfort zone will feel as much part of the group as the jolly crew of regular knitters who have booked in. We aim for you to leave feeling warmed, restored, with new friends and bursting with ideas. Seeing people connecting and enjoying each other and each other’s art makes us feel as warm and fuzzy as a pair of felted socks. Some years ago I was asked as a local journalist to write something about a community initiative creating a giant tapestry. I was in a hurry to get my story and go - but when I walked into the small upper room in an ancient building in Exeter's Cathedral Yard, there was such an atmosphere of stillness and peace that my driveness evaporated. 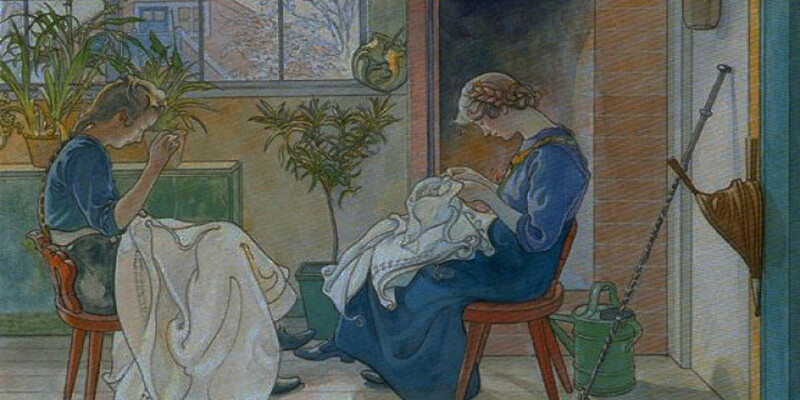 Several ladies sat around a giant canvas stitching, there was a sense of quiet industry in their murmered conversation and the magic of what they were creating under their highly skilled fingers. Despite being more than 20 years ago, the scene is vivid - and I can easily conjure the feeling I had of being at peace.